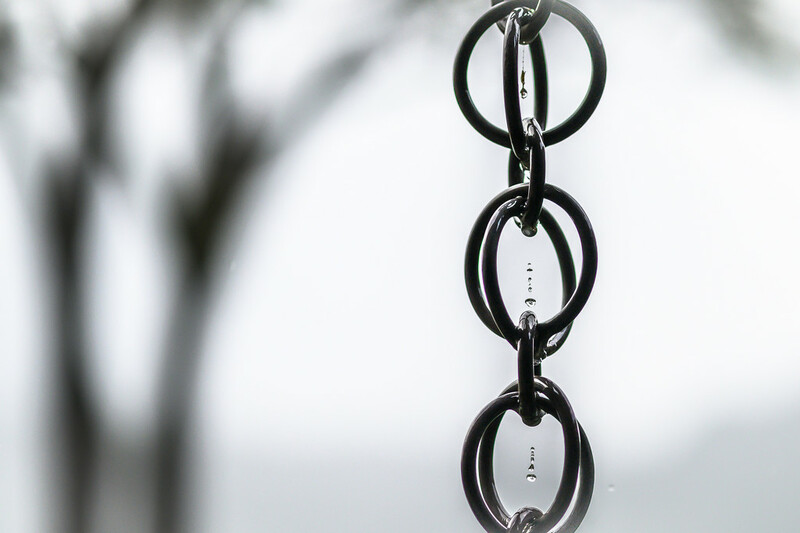 It rained while we were in the Manoa Heritage Center gardens, giving the chains that are hanging as part of the entrance a very interesting steady stream of drops. I was pleased that I could get some of the water droplets in action. So glad we've come to February 28th and the end of Flash of Red, though I did enjoy the challenge. A marvelous image. The water droplets are in perfect focus! This is just beautiful. I need to get out more. ;-/. Stellar finish! Your black and white month looks awesome! Now who would have thought to look through the chains for an awesome picture! This is just amazing - what a marvelous ending for the b&w calendar. Stunning final image! Love those droplets! The water drops are so in line! Vertical. Some people use chains to direct roof water to a barrel or something! Such a wonderful capture of a moment! Love this - the simplicity and clarity of the drops. Wow, great timing. what a fabulous end to the challenge fav. Loving those mid air drips - superbly caught, Taffy. Well done! Good eye and terrific focus on the droplets. Wow, I love the drops. Wonderful capture, Taffy. Super timing on this creative shot. Perfect timing to catch those drops Taffy. Lots of patience (and shots as well, I imagine) required to get such a great capture! This is a Wow! Simple, yet so effective. I was also glad to finish Feb even though I also enjoyed it. Well spotted, and beautifully executed picture. Fav for sure. "amazeballs" a word my daughter uses !!!!!!!! Instant fav for this marvellous dripping art! Fantastic!!! This is one of those images that the more you look at it the more their is to admire! LOVE this -- so perfectly timed! @vankrey and I have tried this many times in Japan where these kinds of rain chains are decorative and functional. Congratulations Taffy number one on TT again! Such a great image! @pamknowler @gardenfolk Thanks for letting me know!! It's been a while so very exciting to see it there -- always special to see a b&w one make it this far! so deserving of the TT, and the top spot there to boot! I wonder how many shots you needed to get this exquisitely timed image. @tdaug80 It took me about 50. Of those, about 5 were “keepers.” Thank goodness for digital!